We all remember this helmet trinket from the gumball machines. 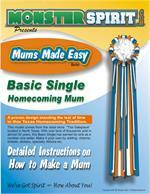 It quickly became one of the top tem charms for Homecoming Mums and garters and is now an industry standard. 12 per package.